As much as we like to believe we can do something good and make it permanent, the world doesn’t work that way. Every day, fewer people remember when the only way to get electricity in rural America was to band together with neighbors—maybe a half-mile away in any direction—and organize an electric cooperative, putting down some of your own scarce cash and applying for a federal loan that—history confirms—would surely be repaid. Some cooperatives are especially good at meeting this challenge. Every cooperative can be. One way the Wisconsin Electric Cooperative Association (WECA) and its member co-ops go about staying relevant in today’s more comfortable world is through the organization, sponsorship, and presentation of the annual WECA Youth Leadership Congress, a three-day event held every July since 1964 at the University of Wisconsin–River Falls. Participants hear from motivational speakers, learn about co-op history, delve into cooperative business and governance issues, and perform team-building exercises, all with an eye toward understanding the co-op business model and its core value of community service. Many congress (YLC) alumni have gone on from that brief immersion in co-op lore to become long-term leaders among Wisconsin’s electric cooperatives. But with the swelling tide of baby-boomer retirements affecting electric co-ops just like other businesses and industries, cultivating the successors to those leaders—successors grounded in an appreciation for the history and philosophy of the co-op movement—brings new importance to the YLC and other cooperative youth and education programming. Deana Protz, public relations and communications specialist at Oakdale Electric Cooperative, shared Oakdale Electric’s youth- engagement strategies during a panel discussion at the at the WECA annual meeting in November. Much media attention is given nowadays to divisions between rural and urban America. No day passes without a few articles about disparities in internet access and career opportunities, and young, new graduates departing rural hometowns for cities, searching for economic advantage. Rural electric cooperatives increasingly are focusing efforts on promoting co-op careers for young people, not to discourage their mobility but to help enhance the economic viability of the communities the co-ops serve. Last November the WECA annual meeting featured a panel sharing insights into methods of reaching out to young rural people, in the interest of attracting them to co-op employment and retaining their talents and commitment in the places where they grew up. One panelist was Deana Protz, public relations and communications specialist at Oakdale Electric Cooperative. Oakdale Electric is a key YLC participant, offering sponsorships to the event for up to six students from each of 12 high schools in the co-op’s service area. If a school has more than six students applying for its allotted sponsorships, an alternate can be picked from a waiting list to attend the YLC in the event of someone dropping out. 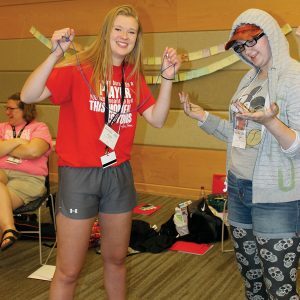 About 35 Oakdale-area students have attended the congress in recent years, adding up to roughly one-fifth the annual number of participants. And the Oakdale-sponsored students have made their mark. Every year, YLC attendees are encouraged to write essays on co-op themes, to be entered in a scholarship competition. In 2018, with entries from students sponsored by six electric co-ops, Oakdale students swept the three available awards. The winners had their sponsorship in common but came from three different schools. In her first-place essay, Tomah High School Senior Clara Krause wrote about the co-op principle of concern for community, reporting on specific activities of six individual cooperatives helping local civic institutions and people in need. Second-place winner Lizzie Patton, a senior at Mauston High School, also focused on concern for community, noting the strong connection of cooperative business principles with social responsibility. 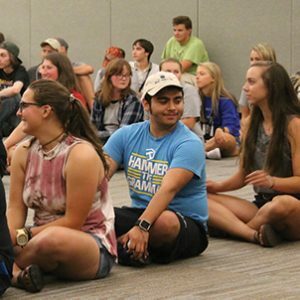 Adrian Rodriguez, a Nekoosa High School senior, earned the third-place award, crediting the YLC with putting the community role of cooperatives into an educational platform. Funded by the Wisconsin Electric Cooperative Association, the awards are unrestricted: Winners can collect their scholarships upon proof of registration at any accredited college, university, or technical school, anywhere. 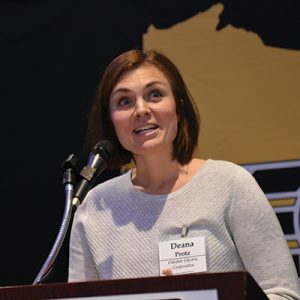 Deana Protz told Wisconsin Energy Cooperative News Oakdale’s notable success in attracting students to the YLC is in part a result of the use of multiple media to promote participation. But she emphasizes that word of mouth and the co-op’s strong relationships with local schools have been the most effective tools in the box. Oakdale Electric also awards its own scholarships for winning essayists in the annual competition, along with other scholarships for non-traditional students, for people intending to pursue careers as electric lineworkers, and for one “at-large” student not attending an area school but from a family served by the cooperative as a seasonal member. In the weeks following her annual meeting presentation, Protz confirmed, at least two additional cooperatives—not among those that had students active in last year’s scholarship competition—inquired about adapting Oakdale’s methods to their efforts at promoting involvement in co-op youth and education programming. Adrian Rodriguez (center), a senior at Nekoosa High School, took third place.